Have you ever feel that you’ve pumped for half an hour but only getting drops of milk? Or your breast still feels hard even though you’ve pumped for so long? Why pumping can not be as simple as direct latch? Pumping breast milk is a learned art that you’ll get better and better with practice. The good news is today I have a few tips on how to pump more milk efficiently. By applying these tips, I managed to get at least 40% more milk than what I used to get. Aren’t you excited to know? PS: If you are in a hurry, scroll down to the very end of the post to download your FREE infographics. You use a good quality pump (here’s my recommendation). All pump parts are in good condition, pay attention to rubbery pieces such as valves that are easily worn out. If you haven’t changed it for the past 1 year, perhaps it’s time to replace it. All connection is tight (not too tight, though), and all tubings are connected securely to the pump motor. Aim to get let down every time you pump. Pumping without let down is simply NOT EFFECTIVE. And now, boost your pumping productivity with these 8 sure-to-work tips. 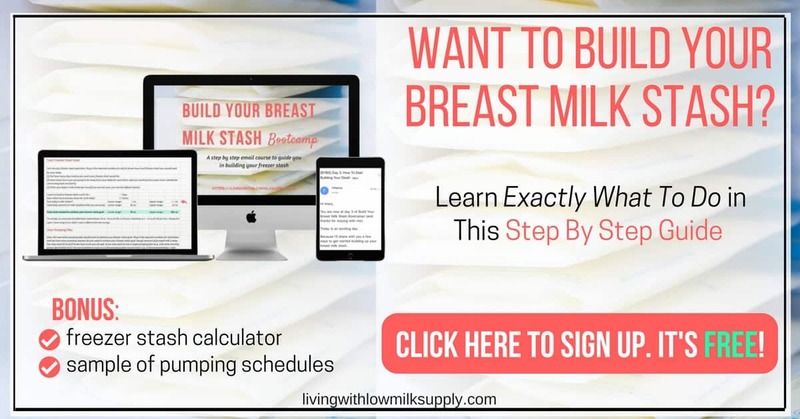 4 Are you struggling to pump enough breast milk? 8 Tips #7: Pump and nurse simultaneously. 9 Are you struggling to pump enough breast milk? My confession: I aim for at least 3 let-downs per pumping session (at work), or two ( if pumping in between feeding). This is my number one milk producing tips, try this! If I only rely on first let down to pump milk, I would only get 60% of milk yield from what I have now. On my desperate day, I even try to get the fourth let down. Yeah, the milk you get from second let down won’t be as much as what you get from the first, but combining them all together, you’ll get a lot more milk. Getting the subsequent let down can be done in similar ways how you get the first. After the milk flow from first let down slows down (hint: you should see only very little or no more milk drips), turn your pump to let down / massage mode again, or use these tips to stimulate let down again). Note: it will take a longer time to get the next let down. So if you are used to getting your first let down within 2 minutes, you may get your second let down within 3-4 minutes. Take it easy.. If you still haven’t achieved let down after 10 minutes, try again another time. Perhaps you are familiar with hands-free pumping. I think you must have seen those before. A video of mom, pumping while working on her laptop, her breast shields are secured to her breast with a hands-free pumping bra. Yea.., it is such a time saver. But if your goal is to get most milk from your breast, I suggest you not to multitask and use your hands to do breast massage. I would still recommend you to get that hands-free pumping bra (this brand is one of the moms’ favorite) so that you won’t need to worry about supporting both breast shield every time. Massage from the outer towards the areola. As you squeeze your breast gently, you will see more milk flow. Continue massaging until you see no more milk drips. Do similarly for the other side. And to convince you that doing this is good to get most of the milk and drain your breast, watch this video. Note that even though the video above is focused on premature babies, this technique also applies to other normal babies, at any age. Nancy Mohrbacher discusses this in details in her article. If you watched the video in the link above (hint hint: you should watch if you haven’t), you will notice that in addition to breast massage during pumping, you can further increase your pumping output by doing hand-expression right after double pumping. In fact, combining hands on technique on dual pumping followed by hand-expression yield the highest amount of milk. Marmet technique is one of the famous methods to do hand expression, here’s a video example to show you how to do it. It’s not really that difficult. But if you are not into hand-expression (don’t worry, I can fully understand =D), you can use a manual breast pump to further empty your breast. Don’t forget to always massage your breast, okay. You don’t need to pump until a certain amount of time, but instead, until you see no drops of milk anymore. 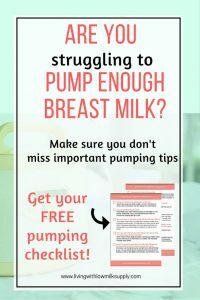 Are you struggling to pump enough breast milk? Do you know that repositioning breast shield may get your milk flow again? Try it! First, is simply to re-attach the breast shield to recreate the vacuum, without changing the location where it was. And secondly, if using the first method no longer gives you more milk, you can reposition the breast shield by focusing on different parts of your breast. If you haven’t tried these tricks before, seriously, try it! Initially, I use these methods only when I pump with my manual pump. But then I found that I can use the same tricks even with an electric breast pump (click here to see my recommended breast pump). Just be sure that you dis-attach the breast shield during the off-vacuum state (i.e. when the suction is not applied). Say, you are away from your baby for 10 hours for work. Which one do you think is better? Having two pumping sessions, 30 minutes each, or 3 pumping sessions, 20 minutes each? Some of you may say, hey they should be the same since the total time spent is one hour for both. But actually, having more sessions will give you more milk. I’ve tested this several times. When I first returned back to work, I diligently pump 3 times a day at work, and able to bring in close to 200-250 ml alone from those 3 sessions. As my workload gets tougher, I reduce my pumping session into two. Well at the beginning, I’m still getting roughly the same, or slightly less amount. But after a few weeks, my supply depleted so much I was running out of my stock. And finally, I went back to pumping 3x a day again to bring up more milk. The emptier the breast, the faster the milk production is. The fuller the breast, the slower the milk production is. As you empty breast more frequently by pumping, you send a signal to your breast to make more milk, and thus you get more. Similarly, when you pump less, you send signals to your breast that milk is not required urgently, and thus, breast will produce milk at the slower pace (and even stop if the breast has reached its maximum storage capacity). This trick will also work even if you pump in between feeding, i.e. for stockpiling breast milk. Rather than having a single long session, break it up into a few short pumping sessions for more milk. Do you know that prolactin (the hormone responsible for milk production) is at the highest during wee hours and early in the morning. This is why typically our breast will feel fullest in the morning. So don’t miss out this opportunity to pump more milk. Just wake up early enough and pump. You don’t really need to wake up in the wee hours, especially if your baby is still nursing at night. But once he sleeps through the night, you may want to consider doing wee hour pumping to maintain your milk production. A silent breast pump with night light (such as Spectra S1 or Spectra 9+) will offer you a lot of conveniences to do this. Typically the morning pump session will yield the most milk compared to other pumping sessions throughout the day (if you are fully pumping in between feeding). This was one of my best trick to get more milk while stockpiling my breast milk. Tips #7: Pump and nurse simultaneously. I love to pump and nurse at the same time, especially when my baby is a newborn. Not only it saves a lot of time, you don’t need to worry about trying to stimulate let down (because baby will do it for you, haha). Pumping and nursing at the same time also send signal to your breast to produce more milk, as if you are nursing a twin. How good is that? Surely a win for you, right. Make sure to use a bra that can be used for both pumping and nursing (here’s a good one). However, please note that as your baby grows older, this trick can get more challenging. Your curious baby will stare at your breast shield (thinking who is this guy, trying to compete with me for mom’s milk, and may start pulling the tubing). Well, that happened to my baby. But anyway, every baby is different, you just need to try first and who knows your baby doesn’t mind nursing while you pump at the same time. PS: I’ve just come across a manual breast pump that works amazingly to collect leaks as you nurse your baby on the other sides. Check it out here. Have you heard about power pumping before? If you have been pumping for quite a while, I believe you already heard about this term. In simple term, power pumping refers to doing multiple-short pumping sessions within an hour period (with breaks in between) and doing it a couple of times a day (at least twice). But… does power pumping really work? The short answer is: yes, it can…. …. Provided that you do it effectively, and you stick to it long enough. When I said effectively, that means, always ensure breast is emptied for every pumping session (so tips #2 and #3 are a MUST). How long does it take for your breast to respond (i.e by producing more milk)? 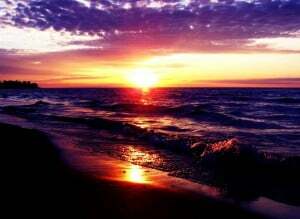 I would say, it depends on a lot of factors such as the age of your baby, the power pumping frequency, and so on. As your baby grows older, you may find that it takes longer time, 2 weeks or even more to notice the effect). This is especially true if you only do this once or twice a day). UPDATE: I’ve created a complete guide to power pumping. You’ll see various ways to do power pumping, including samples of power pumping schedules, case studies (i.e. the power pumping result), PLUS the tips and tricks to make power pumping less daunting to you. Click here to read the full article. Well, sadly, with 2 little kids around, sparing one hour for power pumping is already hard enough for me to do (raise your hand if you can relate). But that does not mean you’re a bad mom. Hey, we all doing our best for our kids, right. So instead of doing power pumping, I do cluster pumping and nursing combo. It’s similar in terms of ‘pattern’, but instead of spending one hour, I only pump two sessions with 10 mins break in between, this is what I did in the morning. Then at night, I nurse my baby, then pump for 10 minutes (baby had daddy time), the nurse again. Check out my FULL pumping story here (starting from the day I started working, rebuilding a depleted stash, until the day I finished my stash). So, yes, if you can’t do power pumping, no worries. Try cluster pumping instead. And it will still help you to increase your milk production. Phew.. What a long post that I wrote. I tried to be as detailed and comprehensive as possible so that you can apply these tips directly in your pumping. To summarize all the points mentioned here, I’ve created an infographic for this to make it easier to understand. PS: You are free to pin and share this with your friends, but please do not republish it on your blog / website. If you want to make reference to this infographic, you can simply link to this post. Thank you! So that’s it. I sincerely hope these 8 tips answer your question on how to pump more breast milk. PS: Other than effective pumping, you can also try these herbs to increase your milk supply. Do you want to add more tips? What is your favorite tip to pump more milk efficiently? I am sure this article will help many new parents because when my eldest son was born 18 years ago, the internet was still not as informative like today. My wife had such a difficult and painful time trying to pump out milk for our son. After few tries, she decided to give up and fed our baby formula. Thank you for your article and it will definitely be helpful to new parents out there. If you have friends who may benefit from this article, please share to them. I love your article. Your right hand massage will give you more milk. It will also increase the amount of milk that you are able to produce. I ended up producing way more milk than I needed, about twice the amount. Your article is sure to help lots of moms like myself. Thanks for writing it. It’s great to know that hand massage works for you. And double the amount of milk that you can pump, wow..
My wife was also having difficulties when starting breastfeeding. The milk only came out 5mL for the first time. Each pumping will give more and more and gradually it always give 50mL without pumping too hard. But sadly she can only breastfeed for 6 months and then the flow just stop. Maybe stress from work influenced her body. Luckily, doctor said that my baby was ready for solid food (mind you, this is still steam and strained food). Thanks for this information. Love the infographic. It is easier to understand. Sometimes I can’t tell if I have a low milk supply or just no extra. I try to pump when I can find the time to increase production, but it is hard to be consistent. I have also used supplements and cookies to help my supply. When I was pregnant I thought that everyone produced mass amounts of milk and had huge stashes of pumped milk in the freezer. Unfortunately, that is not the case and it can make a lot of women feel like something is wrong with their supply. I feel you. It’s hard when you produce a little amount of milk and it seems that everyone else is leaking milk and have a huge freezer stash. Bear in mind that everybody is different. The main point is making enough milk for your baby. You may not have a lot of stashes but still making enough. You may need to feed your baby more frequently (not that3 hourly feeding thing!) and your baby still gets enough. If you are worried whether you have persistent low milk supply issue, I suggest you to join IGT and Low Milk Supply Support Group in Facebook. It’s a closed group that contains a wealth of information about things that may interfere with healthy milk supply. Hi Dana, I have been in the same boat a few months back and was struggling to produce more milk but was unsure what to do. A lactation tea called healthy nursing tea made it possible to feed my baby with full supply. Thank you for this very informative article. I am working full time and spend 14 hours away from my almost 5 month old baby and I have been diligently pumping everyday since I got back to work last June. There’d be days when I feel my milk supply is diminishing (when I have my period or I’m sick or sleep deprived) but I am able to sustain my baby’s milk demand. I do worry though that I may not be able to meet her demands in a few months so I will be using these helpful tips so make sure I am able to pump efficiently while I am away from my milk monster. Kudos to all breastfeeding moms, we rock! we’re awesome! Glad you found the information useful. Good luck in breastfeeding your baby. You’re such an awesome mom. Your website and the information on it has really encouraged me.My baby is two months old but has always been a slow nurser previously would sleep off immediately after she started nursing to nursing very short intervals and only one side due to which I started expressing very early on to make sure she gets enough in that short time( don’t know if that was a mistake) . Last couple of weeks she’s completely refusing the bottle we are using dr brown bottle and teats…. So I stopped expressing totally and as she doesn’t nurse well my supply is extremely low she has barely gained weight in these two weeks and dr says to start formula which is really don’t want to…. Seems that your baby prefers you compared to bottle =). For the teats, perhaps you can try Pigeon Peristaltic Plus, it’s very soft and my daughter likes it. You can read more tips for introducing bottle to a breastfed baby here. Have you tried oats to increase your supply? Some mothers respond well to herbs while others don’t. In that case, perhaps a more-frequent pumping will help you to increase your milk supply. Yes, it is possible. If you are giving him expressed milk without latching, you are doing exclusive pumping. And a lot of mothers did that. You can learn more about that here and here. And, if you want to do exclusively pumping, I suggest you getting a good-quality double electric breast pump (like Spectra S1 or Medela Freestyle) so that you can pump faster. Your manual pump will still be useful to further drain out your breast. Since you’re now only getting 60 ml per day, try to pump every 2 hours for about 15 mins as a start. Use the pumping tips I’ve explained while you pump to make sure your breast is emptied. I just came accross your blog today because i’m facing with drop in supply in this 2 days. I’m quite terrified as i’m am a pump-today-for-tomorrow mom. i don’t have a freezer full of ebm. Only few packets and few bottles. but then i survived almost 2 months after returning to the office. Its just that yesterday I realised that my yield has depleted around 1-2oz each session.I pump 3x at office and never miss my pumping schedule. Just sometimes I maybe late for around 30mins for pumping. I wonder what is the cause of depletion in my supply? I’m not in a stress mode and no menses yet. Thank you for your du’a, it really means a lot to me! But anyway, if we are talking about those IBCLC, they have spent 1000+ hours helping other moms, so I guess it’s reasonable for them to charge such a fee for consultation. Anyway, regarding your milk supply drop, you are probably right about STTN. Perhaps you can add one or more pumping / nursing session per day. Does not need to be long, the point is to tell your breast to make milk more frequently. And yes, please try to do power pumping, I heard a lot of success stories with it. I myself, do a very laid-back style of power pumping, instead of 3 pumping in an hour, I only have two, but then combined with one more nursing session. And another one like that at night, nurse, pump, nurse. It took about two weeks to see the result, but it’s worth it and I didn’t actually need to spend a lot of time doing that. i Just read your article.. my 3months daughter just about to get fed with Formula Milk as my milk stock are never enough. Glad the article helps you, Zie. If you are struggling with milk supply, the first rule is to feed the baby, whether it is formula milk, donor milk, it’s all fine. And then as you slowly rebuild your milk supply, you can slowly replace those supplemented feed with your milk. I wish I could hug you right now. I was in the same position before with my first kid and it was very hard. All the best for you and your baby. Remember, no matter how little your milk supply is, it’s a precious gift for your baby. Thank you for your compliment. I’m glad you like the tips. For the infographics, I appreciate if you could just link to my article and mention there’s an infographic here. All the best to your pumping journey! Brilliant article Rina, you have such a wealth of knowledge and you share it so beautifully. 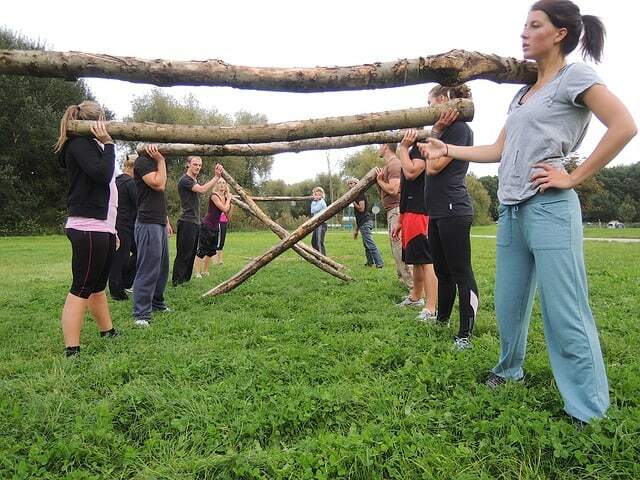 Have you ever thought of becoming an IBCLC? I’ve shared your infographic on Pinterest a number of times. 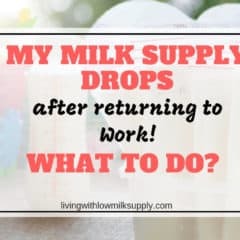 It’s stunning.I had the opposite problem when I started nursing, an over-supply of milk, rather than under-supply, but I meet so many Mums who are struggling with low milk supply, My subscribers would benefit from your story. Would you like to be interviewed on Happy Human Pacifier? Hi Lauren, thank you so much for your kind word. I thought about becoming an IBCLC, but since it will take quite a handful of time from myself, I believe it’s better to wait until my children have grown up a bit. As for now, my family is my priority. I’d very happy to be interviewed on your site. Feel free to follow up on this and we can discuss further. Salam Sis Rina! First of all thank you very much for the informative article, and the blog! I’ve spent many hours during my confinement reading your blog, and I remember feeling more confident about breastfeeding after. Your posts on returning to work also helps me to visualise the process which in turn makes me less nervous about pumping at work. I just wanted to share that in my case, I can extract way more milk using manual pumps than using electric. I use to pump about 3 oz per session (both sides) using electric pumps, and was getting quite worried about pumping enough milk for my baby everyday. However, after using manual pump, I found that I could get 2-3 oz per breast, and I can pump about 4-5 oz per session now. Although it takes a bit more time, (40-45 minutes as compared to 25 minutes using electric), I didn’t have to pump as frequently at work as I used to. Not sure if anybody else have the same experience. Anyway keep on blogging Sis Rina and may God bless your efforts! Wa’laikumsalam Nana and thank you for sharing your story. I believe it is am important reminder for us, breastfeeding moms that not all getting the most from just relying on electric pump. Some are getting more with manual pump, like you. Me too, I always pump with manual pump after using the electric ones because i feel that it can still extract some more milk. Mind to share which brand of manual pump do yo use? I believe other moms are interested to know about it as well. I use Avent Comfort manual pump. I ordered the pump before I saw your review, which got me a bit worried of how the pump will perform. But alhamdulillah the pump fits me well (although I totally understand your point about the flange funnel being too short). After using manual pump, I managed to pump more than my electric pump. For my electric pump, I used Spectra M1. I think Spectra works well, but perhaps the pump suction/cycle is not suitable for me. It’s great to hear that Avent Comfort manual fits you well. I guess different ‘anatomy’ does make different fitting. And thank you for sharing that Spectra M1 suction / cycle not suitable for you. Though i’m a big fan of spectra, I highly recommend every mom to do their own research, coz sometimes different moms prefer different pump. Great that these tips work for you! These are wonderful tips! I especially love “hands-on pumping.” It’s so easy to fall into a trap of convenience though. I was surprised when I learned just how much MORE milk I got from simply doing breast compressions and massage. Awesome post!! yes, unfortunately, most people prefer hands-free pumping. Well, of course, hands-free pumping is wonderful if you have ample of milk. But if every drop counts, hands-on pumping is the way to go. Where would you like us to send your free pumping checklist?